This was a fast-paced session. I captured what I could. Unfortunately, I did not capture the names of some of the speakers. Highlights of the 2016 Conference - Pleased with all of the pre-conference activities. The opening session was a highlight and a clear highlight was Wes Moore. Moore received a standing ovation. Tomorrow David Ferrieo, Archivist of the US, is speaking. Tonight is the cultural event. There are also library and sponsor visits on Friday. Libraries and society - "literate, informed and participative societies". Universal literacy. Campaign for literacy within the UN 2030 agenda. Provide tool kits for library advocacy at the national level. It has been translated into several languages. The booklet is available online. The importance of information and communication technologies (ICT). Information and knowledge - IFLA will be building a framework. Noted the treaty of Marrakesh. Without further action, information in the future is at risk. Advocating for copyright exceptions and favorable policies for libraries. Cultural heritage - Establishment of two new conservation centers. Are working within the guidelines of UNESCO Persists. Want to save cultural negotiate worldwide no matter its format. Building compacity - Raise the voice of librarians at regional and national levels. Advocacy. Working to build strong library associations. That workshop had 60 participants. 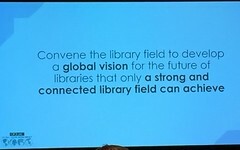 Want to create a more connected IFLA. A strong IFLA is needed more than ever. Will be convening regional meetings and workshops. Working with UNESCO is important. We are able to get on their agenda. Now we cannot stop. They have funding available for library associations to do work in their regions. They also want to bring more representatives from the library community - including public libraries - at future UNESCO meetings. President-Elect Theme - Librarians, the gears of the motors of change. There are 12 people gong through this program, which is geared to develop librarians as international leaders. It is a two-year cohort. This is an important initiative. Want to continue to expand those who are representing us. Want our leadership to mirror our membership. Four week program at OCLC. They spend time in libraries and other cultural heritage organization. The 2017 fellowship class was announced. This will be the 17th class. In total 85 librarians from 38 countries will have gone through the program. ALCTS Webinar on "Creating Effective Webinars"
WLIC2016 : David Ferriero, Archivist of the U.S.